I used to be a minimalist camper. Even when sleeping within a few yards of the car at a designated campground, I’d pack like I was going backpacking. I didn’t bring more than I could comfortably carry. For the last nine years, I have been camping with kids. Everything has changed. Now our weekend camping trips look like a year-long expedition. Sleeping bags, tent, stove, and a cooler full of food are shoved into the back of the vehicle or crammed into our roof carrier. Sleeping pads and a 5-gallon water container fight for space with dishes, camp chairs, and a roll-up table. There isn’t space for another thing. Even with a packed car, I’ve found that wedging in a few extras for the kids can boost our camping trip happiness and theirs. You would think this was more for the adults, but our kids take these over as soon as they are strung between trees. We have two double hammocks so all four of us can fit. When my husband and I aren’t using them, the kids use the hammocks as swings, but mostly we all hop in and read (or nap, in my case). Something about novelty of the hammocks keeps the boys pretty entertained. We bought the Nature Log at a visitor center early in our camping career. Since then the boys fill out one or two pages at every campground. Not only does it give them something fun to do at the campsite and focus them in on the nature around us, it has become a lovely memory book. Maybe laying about and reading and writing isn’t your kid’s thing. A slackline is a strip of nylon webbing strung between two trees that you walk across. It takes balance, core strength, and patience to perfect. But we aren’t looking for perfection here, we just want something for our kids to do. Look for a slackline with rubber grip on the surface or made of a special weave for increased stability. Some of the kids’ slacklines come with an overhead line to help build balance. It’s pretty fun for parents, too. When my boys were little, having a toy in the campsite made all the difference in the world. They would push sticks around with a toy bulldozer, dig in the sand along the shore of a lake, or create a Hot Wheels obstacle course with rocks and pine needles. Kids love glow sticks and they serve a practical purpose: they make kids easy to find when they are running around in the dark. I like the kind you can make into bracelets or necklaces. I do remember the days when toy trucks and cars made all the difference in the campsite! And yes now at 9 & 11 it is much less stuff thank goodess. Traveling the world now there is an adventure! I would take an action figure or doll and a box. 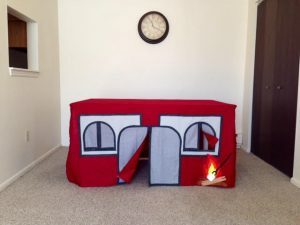 (a shoe box is fine) Then I would have them decorate and furnish their ‘house’ or headquarters out of what they can find at the campsite. They did a lot of weaving leaves and vines for ladders and blankets It is an activity that can last the entire trip and fill up ‘I’m bored’ time. We also would make ‘stone soup’ from the book or any recipe from their favorite book. The Little House series has it’s own cook book.